I have heard that many of the reproductions of Chinese art employ decals instead of being hand painted. Is there a way to tell the difference between paint and decals? The easiest way, is to carefully study the lines in the contours of the decorations. Stencils or decals often breaks when being applied and this could quite easily be seen as an uncalled for interruption in the pattern once you have got your eyes on it. 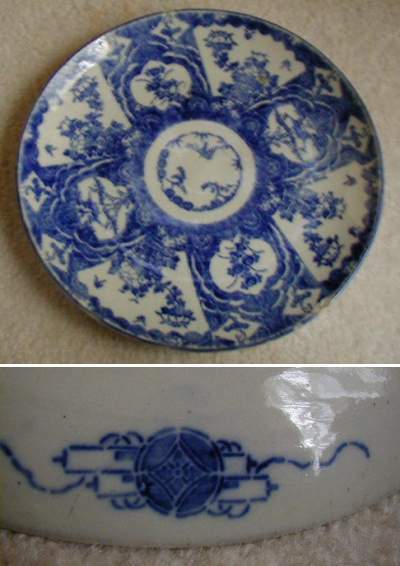 To the right you can see one of the oldest examples of what I am thinking of regarding printed or "stenciled" decoration on a Japanese plate from around the turn of the century or possibly up until a few decades thereafter. Regarding the decoration on recent replicas in general, the blue color is for the moment much better then was ever achieved in ancient times. The pigements are synthetic and gives much more even washes when used, with some kind of a "watery", transparent touch which is different from the old hand grinded and never entirely pure blue cobalt.